A detailed analysis on the Amazonian riverine populations’ diet is presented, based on quantitative data collected by the authors amongst these populations over the last 13 years, with special emphasis on caloric and protein intake. 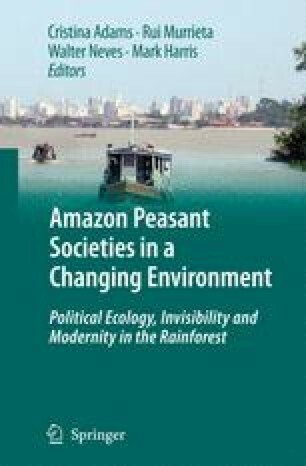 The five communities studied in this article are sited at the estuary (Marajó Island) and Lower Amazon (Ituqui Island) regions. Grounded on almost unique quantitative data on the Amazon region riverine populations, the authors analyse in detail the influence of several local factors in these populations’ food intake variability: ecosystem, micro-environment, seasonality, history and social organisation. In a synthetic way, it can be stated that, in the case of the estuarine flood plain, the main caloric sources are represented by manioc flour and the açaí, whereas in the seasonal flood plain, manioc flour, fish and sugar play such role. Fish represents the greatest protein source, independently of the ecosystem considered. All five communities feature protein intake levels above the minimum recommended by FAO. Regarding calories, only one of the communities (one established in the estuary) meets the internationally recommended minimum for energy consumption. At the end of the article, the authors discuss the anthropological implications of the ubiquity and historical longevity of the association between manioc flour and fish as the mainstay of riverine subsistence.